When big-chain American supermarkets' "idea of international foods selection is carrying both Ortega and Old El Paso", it's quite a shock to step into Universal Meat Supermarket (the "meat" seems to be a holdover from its previous life as a Western Beef). Universal is a real ethnic store. As much as I like stores CitiGrocer and Supremo, they somehow don't have a true authentic feeling, and are extremely Americanized. When you enter this store, or Kam Man Foods, if you're looking for Chinese groceries, the experience is very different. This store opened as a Food Fair, which later became Pantry Pride. It later became a Rex-Gene supermarket, followed by a Western Beef. Universal opened some time around 2005. (Most of this information came from here. Also click to see a daylight photo.) Universal clearly did minimal, if any, renovations after opening in the old Western Beef. It seems that either R-G or WB expanded into a neighboring storefront, and I believe there's another vacant storefront next to the supermarket waiting to be expanded into. Enough talking about it! Let's step inside. This extremely narrow entranceway parallels the front of the store. The exit is to the left. The checkouts are directly ahead. When you walk into the store, you make an immediate 180-degree turn to your right to head into the produce area. I imagine that floor is left over from Food Fair. After making your 180-degree turn, this is what you enter into. It's very similar to the Food Bazaar in West New York, NJ. The so-called "wall of values" is to your right. The doorway straight ahead is where the expansion begins, where produce, deli, and hot foods are. Many stores have these "walls of values", originally designed to conserve valuable backroom space, but the display has become an art form, a way for the store's staff and management to show off their talent. This store has a particularly impressive and well-displayed "wall of values". Sure hope you don't want the one on top . . . or the one in the back. While other stores have small endcaps on the end of each aisle, Universal opts for more huge displays. This store's displays were exceptionally well-done. Here we're looking towards the side wall of the store. The wall of values just ended on my right, and we're standing in the expansion. There's a strange area straight ahead with soda and some random merchandise, then a few baked goods cases (there is no in-store bakery), and then the area opens up to a produce department. In the above photo, we're looking back towards the entrance, back into the original store from the expansion. The front wall is to my left and the produce department is to my right. I can't definitively identify exactly where those "variety", "quality", etc. signs come from. It's unlikely they're custom-made for Universal, but I haven't seen them in a Western Beef either. Along the back wall is a "cafeteria", or hot foods counter. There is also a very small deli counter, neither of which was open when I visited after dinner one night. I'm tempted to say that the lettering comes from an old Checkerboard Arch Acme. Let's figure out some chronology here: according to the article I link to above, in 1998, the Rahway store was still open ("Its remaining food stores are in West Long Branch, Rahway and Sayreville"). The Wikipedia article on the corporation is less than spectacular, simply stating that the chain closed in the "late 1990s". Supermarket News gives us a better look at the timeline, stating on June 1, 1998 that Western Beef was purchasing three of the Rex-Gene stores, with an option to purchase the fourth. Let's say Western Beef closed in 2000 for the sake of this argument. That puts Universal's opening in the same year, let's say, based on the general lack of renovation from WB. What makes that conclusion even more tempting to jump to is that an Acme in nearby Port Reading closed at almost the same time - in September of 2000, according to Acme Style. There's always the chance that the Port Reading Acme had gotten the Checkerboard Arch remodel in the early 1990s, and Universal bought a few key signs from Acme, and installed them in their own store, given that the Port Reading store is no longer a supermarket. It's a possibility . . .
Nah. Too much of a stretch. Here's why. WB closing in 2000 means they lasted just over a year. While I've heard of so-called "crash-and-burn" stores, that's too close. More likely WB made it another four or five years. If Universal did buy the lettering from a closed Acme, why only three signs? Why no frozen foods, dairy, meat, or seafood? The "Western Fish" awning (coming up soon) suggests it's left from Western Beef, and the matching meat awning would have been from the same time period. Universal clearly never had a bakery. 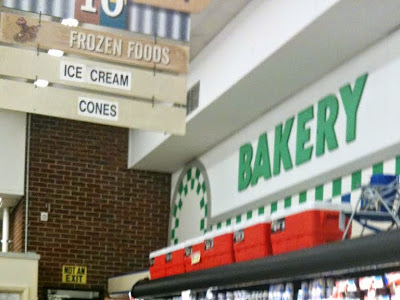 So why would they buy a "bakery" sign, then install it over what was clearly always a general-merchandise aisle? Look at the lettering closely. Specifically look at the R. Notice how the bottom right corner of Universal's is on the diagonal, while Acme's is completely horizontal. There are some minor differences that suggest it is not a former Acme sign. Notice also how Universal's lettering is significantly thicker (as in it sticks out from the wall farther) than the Acme counterpart. Along the back wall of the store is the meat and seafood counters. In the back left corner of the store is a packaged meat department. The corner dead-end is characteristic of Western Beef's mazes -- I mean, stores. "Western Fish" (that one took me a while to figure out - it's a play on "Western Beef", which no longer works) was closed for the night when I visited. Or maybe closed for good, I'm not sure. In the back, where the meat department is, there is polished concrete flooring, leading me to believe this was backroom space for Food Fair/Pantry Pride. Where the (possible) expansion meets the original store. The grocery shelving is still Western Beef's trademark orange warehouse shelving. It doesn't look bad at all here. Past the meat/seafood departments is the dairy aisle along the back wall of the store. Notice the new custom aisle markers for Universal Supermarket. Notice also the embarrassing misspelling of "Pop Tarts" as "Pop Tards", which brings to mind . . . shall we say . . . other images. The last aisle is frozen foods. It was unfortunately too crowded to get a good picture of, but I will report it had yet another, unique kind of flooring. This is at the front of that aisle. Customer service is to my right here and checkouts continue to the left. You're looking at the customer service counter and the entire HABA department. What isn't sold behind the service counter is sold in the shelf to the right. Let's say HABA isn't their focus here. Also check out that lettering on the "Express Check Out" sign. Not only does it (correctly) read 8 items or fewer (not less) -- THANK YOU! -- its lettering is exactly the same as the "PRODUCE", "BAKERY", and "DELI" lettering I was talking about earlier. If I were forced to guess, I would say that lettering is left from Rex-Gene, and was repainted by WB or Universal (the lettering earlier was very obviously repainted). A few more exterior photos before we move on . . . This is the sign facing Elizabeth Ave. It's not lit but at night, the hot food area is closed anyway. Don't ask me why Cuban Sandwich gets its own lettering style. There is one row of parking spaces between Elizabeth Ave and the store, but there is more parking on either side of the building, as many supermarkets of this age are set up. With the exception of this one streetlight that I for some reason was taking a picture directly into, the building and parking lot were surprisingly dark. Many supermarkets, especially in less-safe areas, have much better lighting. Rahway isn't that bad of an area, but I sure would rather feel a little safer around a store as major as this. Is Universal rocking the boat of the grocery industry? Maybe not, but they're doing an excellent job of what they are doing: ethnic foods. Strangely enough, even though they cater to a mainly Hispanic market, the owners appear to be Indian and the store manager, whom I saw at the store, is African-American. Regardless, it's the only supermarket in Rahway, so it certainly fills a need. Rex-Gene seems to have originally shared the space with Kmart, but when R-G closed in 1998, I don't think Western Beef ended up moving in, and Kmart expanded into the old R-G. I don't know for sure that this is where Rex-Gene was, but it's the most likely former location in Manalpan on Gordons Corner. Key Food later tried opening a Fresh & Natural Market in a much smaller location at the other end of this mall, but failed, and Uncle Gino's Marketplace has opened in the old KF space. The ShopRite was owned by the Saker family and moved to its current location in the mid 1980s. Rex-Gene would have moved in soon after ShopRite left. The 30,000 square foot location was divided between Drug Fair and Family Dollar after WB left. Lol at the "Pop Tards," and although I admittedly ignore the express lane signage most of the time, glad to see there's another grammar policeman around, haha! I guess there's just a certain style of lettering that's popular at any given time. It's just surprising that this is so close to the ACME sign. And while we're on the topic, ACME is also one of the very few stores around here that correctly identifies the express checkout as "X Items or Fewer", Whole Foods being the other. I recognized those Bakery and Deli signs immediately as mid-90s Edwards Super Food Stores signage. All of the Mayfair Foodtown-to-Edwards conversions that I was in had signs just like that. Maybe these come from the former Linden location that's not too far away. The Express Check-Out sign also probably comes from Edwards, as well as the small square food pictures that say "Quality", "Freshness", etc. But those department signs are unmistakable to me. You are correct on the location of the Manalapan Rex Gene. 300 Gordons Corner Rd. The store opened as an Acme in ~1973 and closed in ~1995.